Whining on Twitter is surprisingly fruitful. I highly recommend it. After reading Andi Marquette’s post on Queer Romance Month about how there “isn’t much interest in f/f” I was like, “But…I’m interested in f/f…” So I poked around on Amazon and GoodReads a little bit and queried Megan Mulry, who had mentioned the post on Twitter and who I hoped might have an inside line on recommendations for excellent f/f romance for me to read. But as one of the commenters on Andi’s post said, I needed a map to the lesbians! And as it happened, Andi herself came to my rescue, particularly as regards the anthology I’m reviewing today, which she hesitantly suggested might be up my alley. Lemme just say, oh hell YES it was! All You Can Eat: A Buffet of Lesbian Erotica and Romance , edited by Andi Marquette and R.G. Emanuelle, is an anthology that combines food-focused short stories with a recipe. It’s like it was written just for me! 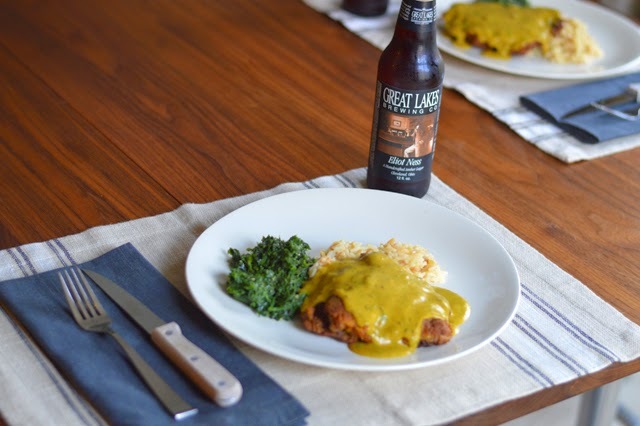 Some recipes are literal, like the curried chicken fried steak I made using Karis Walsh’s recipe from the book. Others are metaphorical and just for fun. It makes for a diverse selection of readings that’s perfect for anyone just discovering lesbian romance. I’m just going to highlight a couple of my favorite stories, but the whole anthology is really well done. The first story in the book by Ashley Bartlet is Fresh Fruit, a light-hearted first-person account of a guerrilla fruit collector and the woman she meets under awkward circumstances while casing an orange tree. See, in Southern California, a lot of people have fruit trees in their yards. And if the fruit is on public property or overhanging a public street, it’s technically available to anyone. The premise is charming and the light-hearted interlude that follows completely delivers. Burn by Rebekah Weatherspoon, on the other hand, has a completely different vibe. An established couple has hit a rocky patch as a result of unemployment, shame over a lack of financial equality and resentment. There’s also the context of a sister who helps the well-intentioned, but kind of clueless protagonist navigate what has become an awkward, sad situation. It has a bittersweet beginning and happy ending and a recipe for spinach and chicken lasagna that looks really yummy. Finally, Crème Brûlée by Sacchi Green, was the story of Rory and Raf, a pair of women who had met the summer before in the context of the restaurant where Rory works when Raf was still with a younger woman. Rory and Raf are more of an age and both of a more dominant temperament, but they shared a moment before and it becomes clear over the course of the story that Raf is now perhaps in the market for more a more balanced relationship than the one she had with her previous sub Juliana. The setting, the language, the description of Raf (“the biggest, baddest gray-fox butch around” who “gives all the baby-femmes wet dreams”) and the descriptions of delectable restaurant food all really worked for me. These three stories (and East Meets West by Karis Walsh, which I’ll discuss further below) were among those that stood out to me personally, but the whole anthology was delicious. So if you’re new to the world of f/f romance like I was, All You Can Eat as a great starting place. Or if you’re not, it’s still a nicely diverse collection of well-written stories with a common theme, but very much each with their own voice. Okay, so I know what you’re probably thinking. 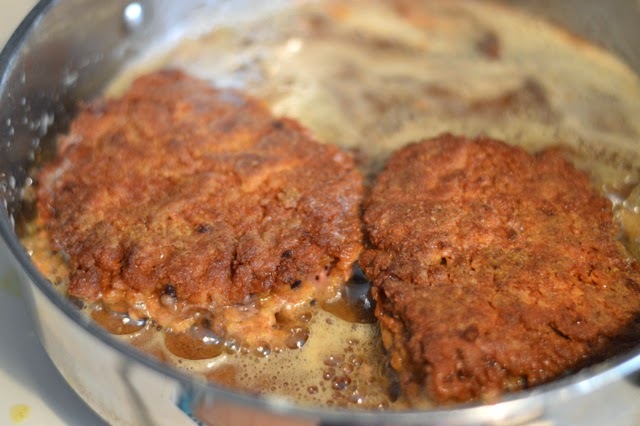 Chicken fried steak? Are you serious, Elisabeth? That’s no Nutella Crème Brûlée or Roast Duck with Citrus Cherry Port Sauce. Except it totally is. 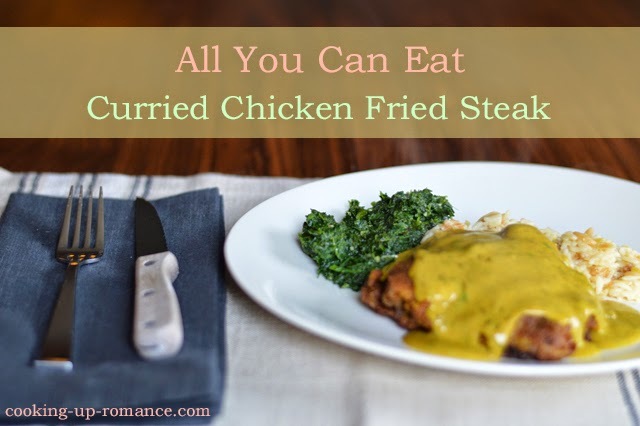 The curried gravy with the crispy steak coating is so flavorful and fun and different. Karis Walsh’s story in this anthology, East Meets West, is based on a chance meeting between a Texas cowgirl and woman who has moved from India to the United States. She has found friends and a job she loves, but she’s not connecting with the cuisine, which all seems heavy and bland. So when she’s invited over for dinner and her date feeds her this dish, she is incredibly flattered. The interplay between Rena and Liz is lovely; a meeting of two people and two cultures that turns into something very sweet indeed. As for the recipe, I’ve included just a few extra steps below for less experienced cooks since I promised certain people never to print “salt and pepper to taste” again. Y’all know who you are! I’d recommend measuring out ingredients beforehand on this one. It’s not complicated, but it does come together rather quickly at the end. I served it with rice and a simple sauteed spinach with olive oil and garlic. There’s also a salad in the story that would be terrific, but you’ll have to buy the book for that! I can tell you this is the only way you could convince me to eat chicken fried steak. 1. Heat grapeseed oil in a large pan over medium-high heat until it reaches 325 degrees F in a heavy pan. Set the oven to “low” or “warm”. 2. Stir together flours, baking powder, baking soda, curry powder, salt and pepper. 3. In another bowl, beat eggs and buttermilk. 4. 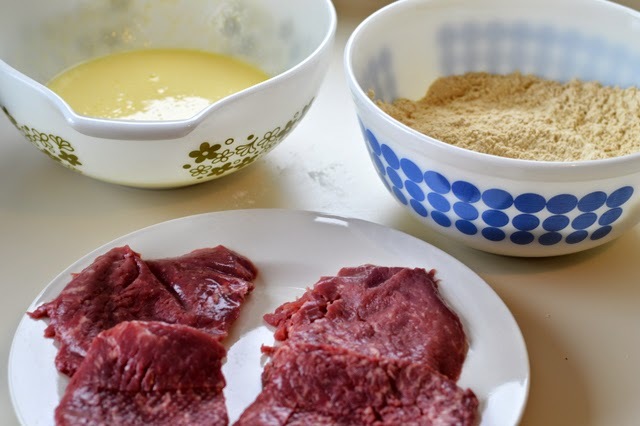 Dip the steaks in the flour mixture, then the egg mixture, then in the flour mixture again. Be sure to coat thoroughly. 5. Fry the steaks until brown, about five minutes per side. Remove them from the pan, drain on paper towels, and keep warm in a low oven while you prepare the gravy. 6. Combine the flour, garam masala, turmeric and ground coriander in a small bowl. 7. Pour off all but 5 tablespoons of oil from the pan (keep the browned bits on the bottom!) and add cumin seeds. 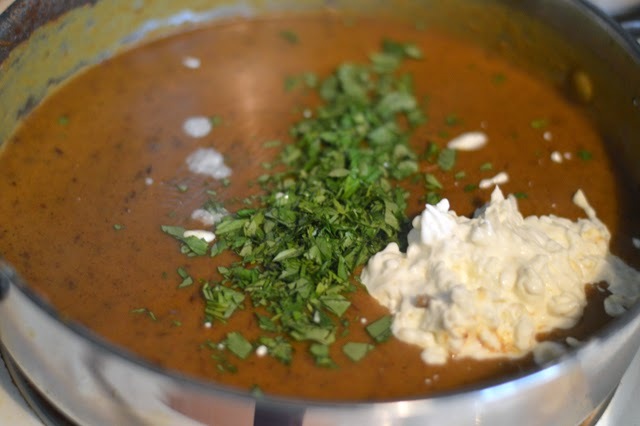 Cook over medium heat until fragrant, and then sprinkle the flour and spice mixture over the oil. Whisk until pale brown. Add the broth and deglaze the pan by scraping the yummy browned bits off the bottom. Bring to a boil and cook until thickened, stirring often. 8. Add the yogurt and cilantro and whisk to combine. 9. Remove from heat and finish with fresh lime juice. 10. 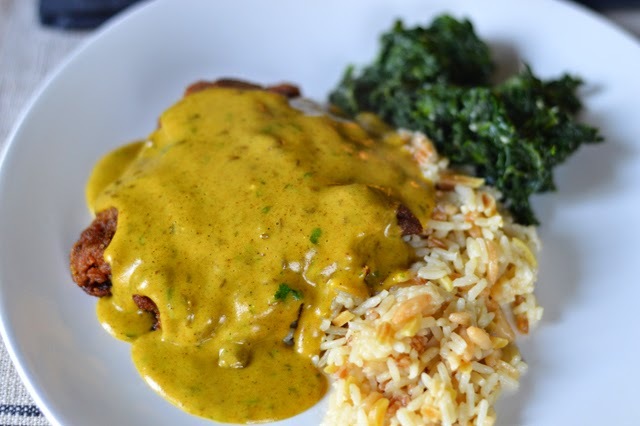 Serve steaks and gravy over basmati or jasmine rice. Disclosure: I received All You Can Eat from the editor for review consideration.